A marble lekythos (a tall vase used to hold oil) dating to the 4th century B.C. 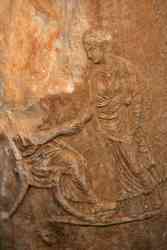 and inscribed with a funerary scene was returned to Greece April 17th. 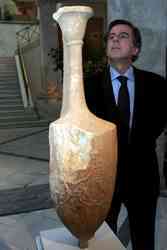 It had been in the (indubitably grubby) hands of a Swiss antiquities dealer, surprise, surprise. It is a funerary lekythos depicting a farewell banquet for the deceased, in a classic farewell scene. It was presented at an international antiquities dealers exhibition in 2007 in Maastricht, where it was put up for auction by a Swiss antiquities dealer. After a series of negotiations, the Swiss dealer decided to hand over the lekythos to the Greek government in an out-of-court settlement, without reservations or conditions. It was delivered to a representative of the Greek embassy in Berne and then crated in the customs free zone in Basel before being transported to Greece. That’s actually a rather notable feat. Switzerland has been a central staging ground for antiquities dealers to hold looted and stolen artifacts before sale because it has no laws against importing illegally exported goods. Last May, however, the Swiss and Greek governments signed an agreement requiring both countries to actively seek out illegally exported antiquities and repatriate them. Here’s the dealer in question’s website, btw. I wonder how much of that treasure is loot.